The Swarm was eliminated in the quarterfinals by the EMBA Quakes, 10-5. Despite HRs by Connor and Yassin, the team could not overcome a late game grand slam and went down fighting. Although disappointed with the results on the field, the team’s spirit remained high as they took in the sights of Cooperstown one last time. They even had time to go fishing in Lake Otsego catching a dozen blue gills. All fish were released. No injuries were reported by Swarm players. To complete the week, the Swarm participated in the Closing Ceremonies where they received their A.Y.B.H.O.F Rings. Tomorrow, we begin our journey back to San Diego. It has been a memorable week for everyone. Thank you to everyone for you support! The Swarm advanced to the Elite 8 of the Cooperstown Classic with a 9-0 victory over the Gorillas. 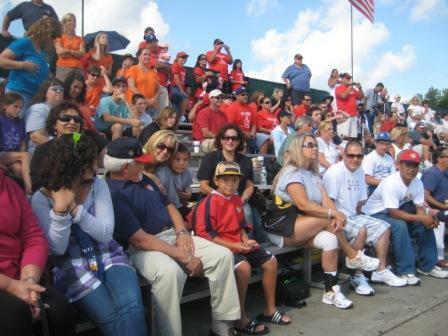 The Swarm used constant pressure on offense by scoring in five of six innings. Long balls continued with two 2-run HRs by Connor and Jordan. Swarm base runners also applied pressure with Jaylon and Tristan scoring on close plays at home plate. Late in the game, Bobby entered with a pinch-hit single that scored the final run in the offensive barrage. Lane was stellar on the mound pitching a complete game 1-hit shutout for the win. Tomorrow, the Swarm will play the EMBA Quakes as tournament play continues. The Swarm completed pool play with wins over the Central Florida Red Raiders and Washington Township Minutemen. With the 6-0 record, the Swarm earned the #2 seed for the single elimination tournament. In the first game of the day, the Swarm overcame a four-run deficit to prevail in a 6-5 victory. Jordan hit a 2-run HR to start the comeback. The rest of the comeback was a team effort as multiple hits were used to manufacture the winning run. On the mound, Dillon started the game with Jaylon coming in from the bullpen to earn the win. Jordan was credited with a save by striking out the side in the last inning. In the backend of the double header, the Swarm bats came alive early and often. After the first five batters scored, including a 3-run HR by Rob, the Swarm went on to post a 14-2 win. Dillon (solo) and Yassin (2-run) hit HRs to add to the offensive attack. Dylan recorded his second complete game win of the tournament. After a full day of baseball, the team and entire traveling party attended a BBQ hosted by Paul, Javy and Justin at their farmhouse. As the #2 seed, the Swarm earned byes in the first two rounds of the tournament. They will play the winner of the Gorillas v Cohasset Cobras/MLI Phantoms Gray winner. The Swarm continued tournament pool play with wins over the LI Panthers and MLI Phantom Gray. In the opening game, nine different Swarms players scored in the 19-7 win over the LI Panthers. The offense was lead by Jordan’s 2 HRs (2-run and 3-run) and Jaylon’s 3-run HR. Chase continued his streak by reach base in eight consecutive at-bats. Jaylon earned the win with three strong innings. Lane and Devon came in from the bullpen to hold the lead. In the night cap the Swarm defeated the MLI Phantoms Gray by a score of 10-2. Connor pitched five strong innings, striking out 10. Jordan capped-off the game by striking out the side. On offense Connor help himself by hitting a 2-run HR in the first inning after Chase led off the game with a solo HR. In the third inning, Jordan and Jaylon hit back-to-back HRs to continue the power surge. After the last game of the day, the team took in some local flavor by eating at Dimaggio's, a Cooperstown classic. The Swarm will complete pool play tomorrow with games against the Central Florida Red Raiders and Washington Township Minutemen. 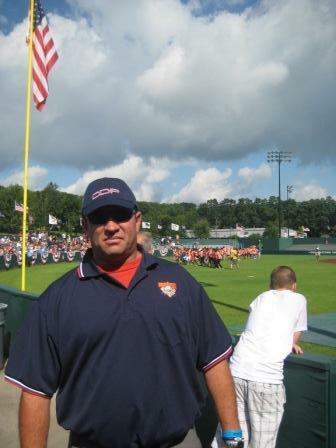 The Swarm participated in the Opening Ceremonies and Skills Competition which marked the start of the Inaugural Cooperstown Classic. A special honor was given to Hailey Robertson who was awarded the Ceremonial Game Ball by the founder of Cooperstown Dreams Park. 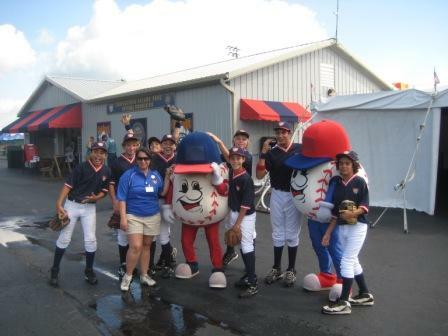 See Hailey on the Photo Memories page of the Cooperstown website. Yassin, Jordan, Jaylon, Devon, Tristan, Rob, Bobby, Chase, Dillon whipped the ball all over the field in the Around the Horn Plus competition. Dylan threw lasers in the Golden Arm competition. Lane sped through the Roadrunner competition. In the King of Swat, Conner placed 5th sending two HRs - one out of the park. 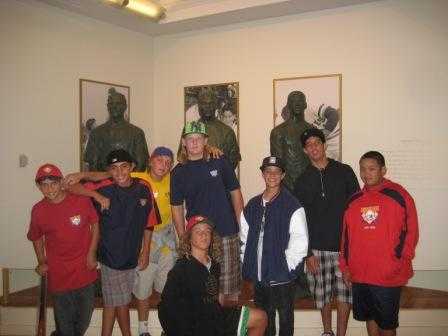 See Connor on the Cooperstown website. The Swarm opened tournament play defeating the South Jersey All-Stars 15-3. After a slow start, the bats exploded in the fourth inning as the team scored all of their runs. The inning was highlighted by a 2-run HR by Dillon. Dylan pitched a complete game for the win. In the night cap, the Swarm bats continued to warm-up with a four HR barrage – Yassin (solo), Jaylon (2 run), Dillon (2 run) and Dylan (solo). Rob earned the win pitching a four inning, one hitter. The Swarm continues pool play tomorrow against the LI Panthers and MLI Phantom Gray. After 20 hours of travel via Newark, NJ, Baltimore, MD and Minneapolis, MN, the San Diego Swarm arrived at the birthplace of baseball, Cooperstown, NY tired but excited to participate in the Cooperstown Classic. Upon arriving in the Players Village, the team settled into the Stan Musial Cabin, received the new uniforms, participated in Media Day. Opening Ceremonies has been canceled until Sunday at 9:00 AM. Game times for Sunday have been re-scheduled to 1:00 PM and 5:00 PM. With the cancellation tonight, the team enjoyed a great home cooked meal by Janet, Jill, Amanda and Angie. 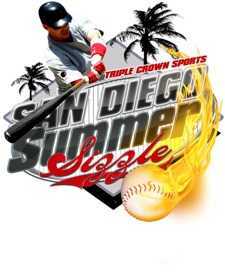 In their final tune-up before heading to Cooperstown, the San Diego Swarm completed a 4-1 weekend by defeating the San Carlos Angels 9-1 to capture the Triple Crown Summer Sizzle championship on Sunday in Lakeside. Lane O'Dea returned from the DL and tossed four innings, giving up a lone solo homer to get the win, and Dillon Wirkus finished with 2 shutout innings to get the save. Chase Grant (2), Jordan Pearce (3), Connor Kleis (2), Dillon Wirkus (2), and Rob Simsiman (1) tallied 10 HR's in the 5 game series. Chase led in hits with 11, followed by Jordan with 8. In addition to Lane, tournament wins were collected on the mound by Dylan Robertson, Connor and Jordan, who beat the Mashers with 11K's in the semi-final. The Swarm will wrap up preparation this week with a few practices and then fly to New York on August 28. 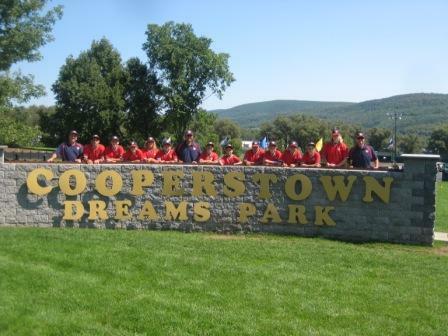 You can follow the team on this Web site or check out www.cooperstowndreamspark.com for live broadcasts. 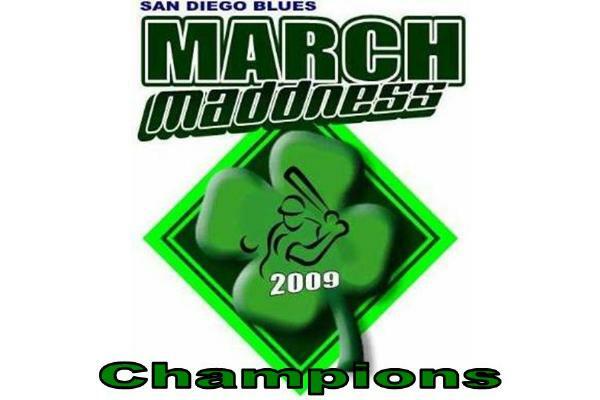 The 9U Swarm fought hard to win the 2009 San Diego Blues March Madness Championship. In the two day format over two weekends, The Swarm finished pool play with a record of 2-1 with wins over Ballhogs BBC (7-3) and Carlsbad Invaders (23-7). The only loss in pool play was a close 10-9 decision to Mexicali FA. The Swarm bats came alive in the championship bracket. The team advanced to the finals by defeating the Carlsbad Invaders 17-3. In the championship game, The Swarm seized the opportunity to avenge an earlier loss by run-ruling a very good Mexicali FA team 11-3. 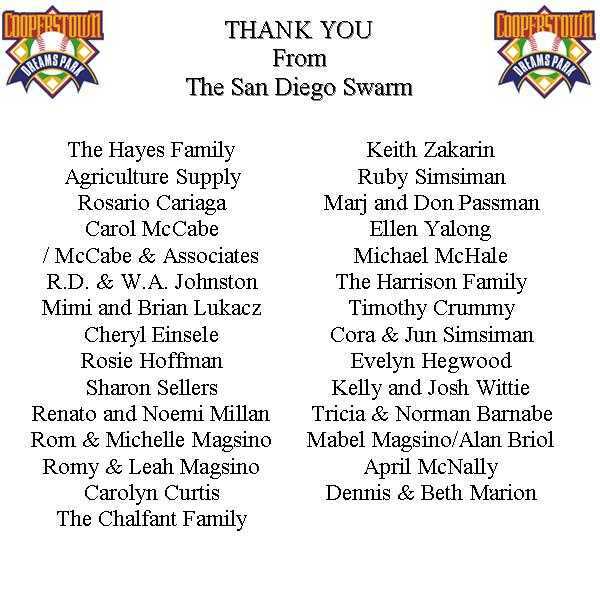 The Swarm would like to thank Tony Hill and the San Diego Blues organization for a well-run tournament. 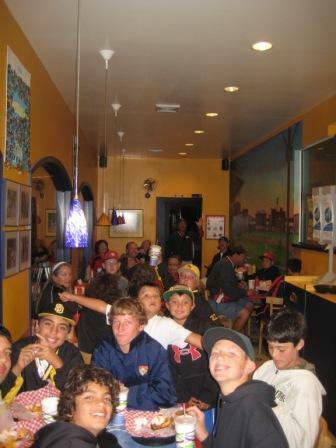 The Swarm also thanks and wishes all the teams - Ballhogs BBC, Carlsbad Invaders and Mexicali FA - best of luck in future tournaments. 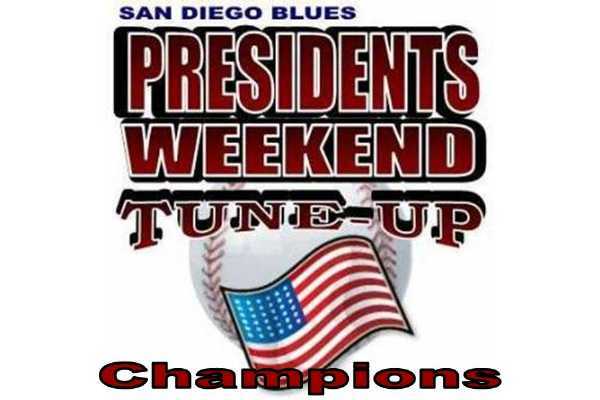 The 12U San Diego Swarm used a huge offense to win two games, then rode great pitching to win the championship in the Blues Pre-Presidents Day Tournament at Rios Canyon Sports Complex. In game 1, Jaylon King pitched a complete game and added 4 hits including a long home run as the Swarm beat the Santee Hornets 17-4. All nine players scored a run and knocked in a run. Chase Grant, Jordan Pearce and Dylan Robertson each added three hits while Thomas Zlatic and Tristan Sizik had two. Jaylon, Jordan and Dillon Wirkus each hit a homer in the 20 hit attack. In game 2, Dylan Robertson got the complete game victory on the mound and drove in 6 runs including a grand slam home run to defeat the So. Cal. Aztecs 12-2. Yassin Wahhab, Jordan (his 2nd homer of the day)and Tristan led the offense with two hits each while Jaylon hit his 2nd homer of the day. In the championship, Jordan hit his 3rd home run of the day and pitched a 9K, 3 hit shutout to defeat The Show 3-0, wrapping up quite a birthday present for his Dad (Coach Woody). Yassin drove in the only run Jordan would need in the 2nd, and Jordan's 2 run shot sealed the deal. A big thank you goes out to Bobby Kruszulyak who filled in for Rob Simsiman and played three solid games including catching Dylan's game two victory. The Swarm return to Lakeside next Sunday to play in the President's Day USTBA Super NIT championship round make-up game against the Norwalk Sting Rays in Lakeside. 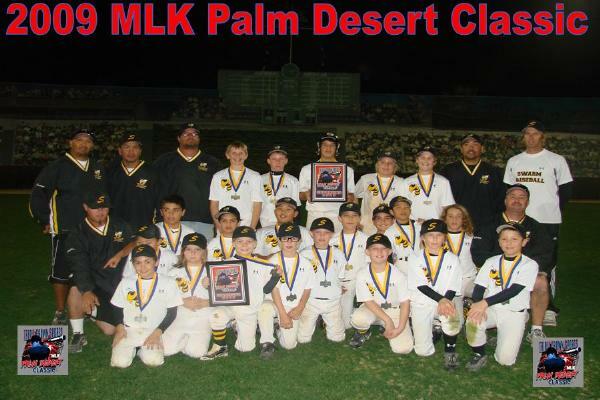 The 9U Swarm capped off a successful weekend capturing runner-up honors in the MLK Palm Desert Classic. 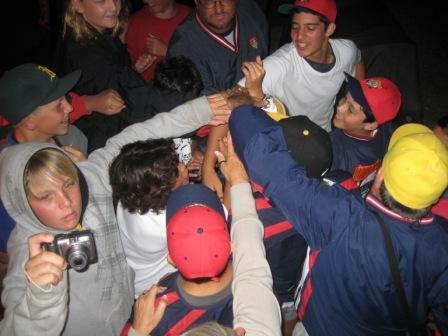 After winning by run rule against Xplosion Baseball, the Swarm battled but could not overcome lapses at critical times in the Championship game against the Chino Hills Coyotes. The 12U Swarm also defeated the YV Valley Thunderbirds by run rule in the semi-finals. 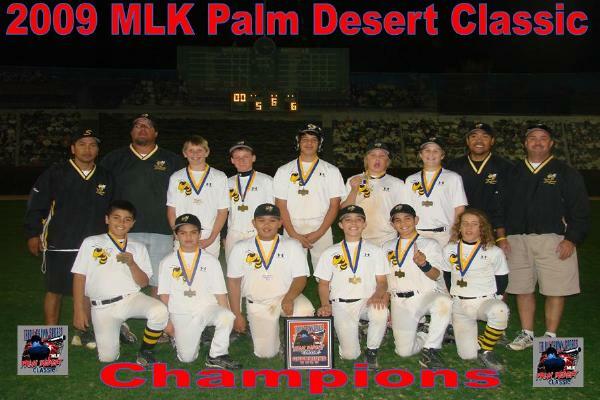 In the Championship game, the Swarm won a hard fought title by beating the Santa Clarita Redhawks on Jaylon King's game winning single in the bottom of the 6th. By virtue of their performances this weekend, the 9U and 12U Swarm teams qualified for all of Triple Crown Sports National Tournaments - Spring Training Championships in Phoenix, World Series in Steamboat Springs, and Fall Nationals in Las Vegas. The Swarm teams each earned #1 seeds in bracket pay based on the first day of competition of the MLK Tournament in Palm Deset. The 9U Swarm battled to a 1-1 record in pool play. 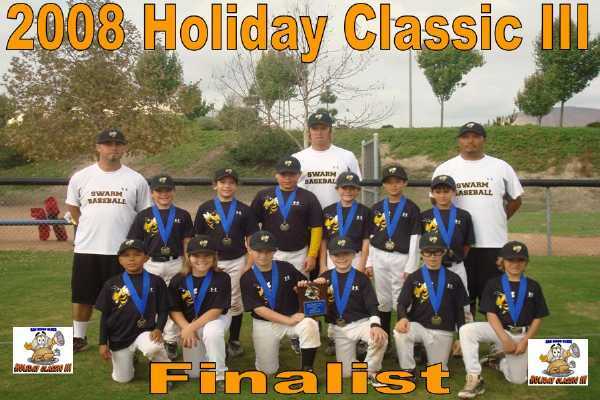 In the first game of a doubleheadet, the 9U Swarm defeated the Chino Hills Coyotes 8-4. In the nightcap, the Swarm lost a tight battle to the Inland Empire Elite. The 9U Swarm opens D2 Championship Bracket play at 1:30 on Sunday against the winner of the Xplosion/Pass Heat Baseball game. 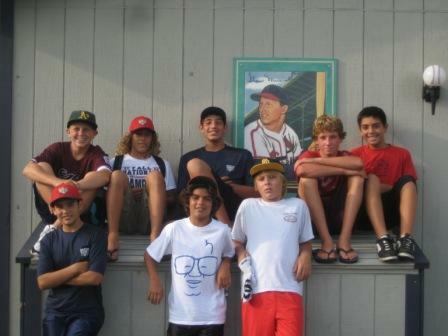 The 12U Swarm swept their Saturday's game defeating YV Valley Thunderbirds 7-4 in the opener. Playing back-to-back, they defeated a very good DC Sluggers team 7-3 to earn the top seed. The 12U Swarm opens Championship Bracket play at 3:00 on Sunday against the winner of the Rancho Santa Fe Titans/VY Valley Thunderbirds game.